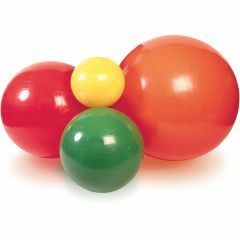 The Cando Inflatable Exercise Balls are used by pediatric and NDT therapists as an aid for vestibular movement and equilibrium therapy, by fitness professionals as an aid for stretching and strength programs, and even by pregnant women in birthing classes, and people with back problems. Cando Inflatable Balls have a non-slip PVC vinyl surface that is ribbed for extra security. The balls may be "under" inflated to give a soft, mushy feel or "over" inflated for a firm, bouncy feel. Super inexpensive! . Easy to inflate.. Alternative seating in a . Kindergarten class.. I will be using these for alternative seating in my K class. This is the best price by far I have found! Product is ok, works fine, is good quality. I called prior to ordering to get estimate on shipping, paid the extra fees to have arrive in time, but it did not. Disappointed in that. works for some of my exer. The ball is oblong instead of round, making it difficult to to certain exercises. How are the Cando Inflatable balls inflated? What type of pump is needed? What are the loose parts that came with the Cando 75CM ball. I.E. a fork shaped object, a probe looking object, and a threaded cone shaped object. How are the balls measured? Diameter or Around?